Actually, I rode to Loa today. I had planned to ride farther, but too much climbing, too much heat, and an hour or two of bad headwinds slowed me down. When I got to Loa, I found that there was only one place that people can stay: an expensive lodge, and it was full (this being Friday night) so, even if I wanted to pay the price, there was no room available. I had decided to stop because, as a guy who works at a service station there put it:"It is fifty miles, all uphill, to the next place to stay." Since it wasn't practical for me to go on, I rode ten miles back to Bicknell which has two inexpensive motels. I rode about 75 miles today, and climbed about 3500 feet, but I ended up 55 miles from where I started. It was just terrible having to ride the, very nice, stretch between Loa and Bicknell! Not. It was quite nice and my only regret is that I'll have an extra ten miles to ride tomorrow. 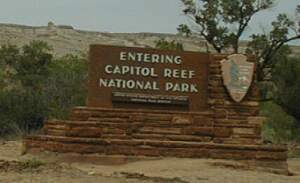 I started out, a bit late at 9:15, heading west on UT 24 toward Capitol Reef National Park. I was late mostly because I spent time visiting with the lade who owns Blondies where I ate a good breakfast. She was the one that told me Loa had motels, but, to be fair, it did, until a few years ago. She helped me a lot with my possible routes north from here. Then I got a state map and played routing with Street Atlas for a while before I left. It ain't easy routing through this state! US 24 was bumpy pretty much the whole way, but otherwise fine riding. It was pretty flat for the first 20 miles or so, with neat views and then it gets hilly and even more spectacular. If you like wind and water eroded rocks, this is paradise! There is a café about 15 miles into this ride and there are services at about the fifty mile mark and then they are pretty regular to Loa. Huge slabs of rock have been pushed up from the earth and then eroded into fantastic shapes. 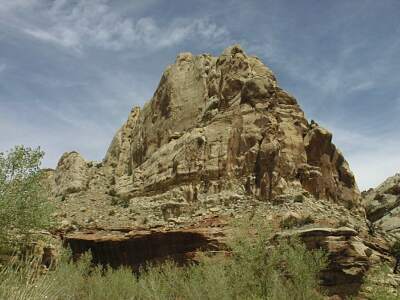 UT 24, in Capitol Reef National Park, follows the Fremont river trough some incredible scenery. 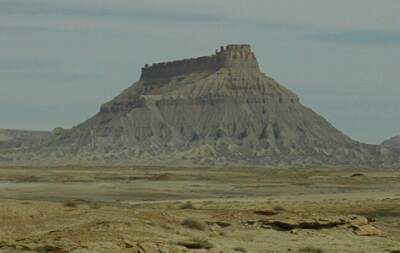 Thousand foot high rock walls, buttes, and mesa is all kinds of shapes include a butte that looks like the dome of a capitol building and many others that look like reefs. It was great riding through the park. I had stopped for a break and a snack about 25 mile into the ride. Then I stopped at the Visitors Center which, at 37 miles into the ride, is actually near the western edge of the park. I was tired and hungry by the time I got to the visitors center, but the only 'food' available there comes from a coke machine. 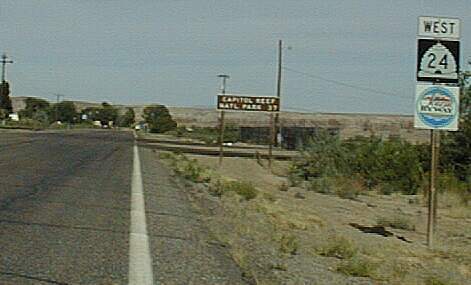 I had a coke and visited with some folks I had said hello to in Hanksville, then I headed west. 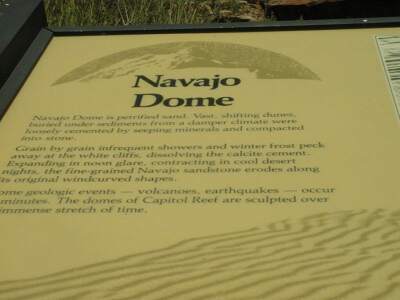 There was one good climb from Hanksville to the park which climbed 300 feet or so at 5%, but heading west from the visitors center meant a 1000 foot of climbing in the next couple of miles. It was hot (95 F) and I had one those gentle tail winds which make climbing really hot, so it wasn't a fun time. After getting to the top of the first part of that climb, there is a road off to a 'panoramic view', which I took. The view, looking back at the park, was great and I visited with a fellow from Alberta who had passed me several time with his large fifth wheel type RV. I told him what fun touring was and how intense the memories were. Then I cranked on down the hilly road, which climbs to about 6500 feet (the visitors center is at 5500) before reaching Torrey. I stopped to eat - it was 2:30 or so - at one of the restaurant before Torrey. When I started riding again, it was into a stiff headwind and the ride through Torrey and for many miles beyond became a real grind: uphill into a 15 to 20 mph wind at five to eight mph. Not fun. I saw my Canadian friend again a restaurant on the other side of Torrey. I pulled over to let him know that this was not the memorable part of touring! There was hostel, as part of an RV camp, on the west side of Torrey. I was tempted, but continued cranking on into the wind. Several miles later, when UT 24 turns norhwest on its way to Bicknell, the wind abated. There was also rain visible in the higher hills all around, but only a few drops fell on me. When I got to Bicknell, I stopped for another break and considered whether I should call it a day. It was too soon and the riding conditions had improved, so I continued with my, enjoyable, but otherwise futile, ride. 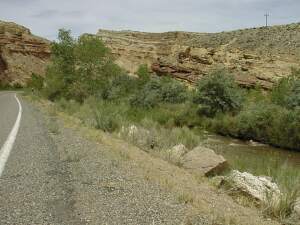 The fellow that suggested this route said it was one of the nicest fifty miles (from Loa through the Park and a ways out the other side) of riding that he knew of. I think that is true, heading east. Heading west means a lot more climbing - several thousand feet more since 24 climbs from 4200 feet to over 7000 feet - and the good possibility of a strong west wind. I did really enjoy Capitol Reefs, but I didn't enjoy riding from there to Bicknell. In fact it was a pretty miserable ride. From Bicknell to Lao, and even more so form Loa to Bicknell was good riding. 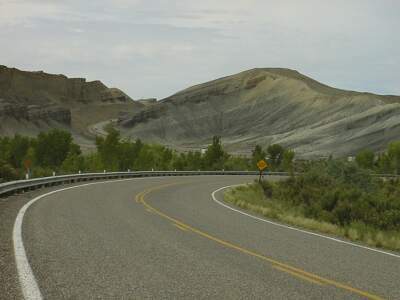 I suggest, if you are riding this section of UT 24 for pleasure, you do it west to east!